Today, we're going to take some time and explore the characters within your story by first asking questions to reveal backstory, before deciding on their personality and appearance. First of all, you have to find out who your character is and who she was. What does she most want? What is her opposite desire? Can your character want both at times? And why does she want it? Humans have conflicting desires all of the time, and so should your character. For example, last night I wanted a brownie, but I also wanted to be healthy and avoid sugar. What conflicting desires does your character have and why? Which desire wins in the end and why? What is driving this behavior? Writing is often an exploration of finding the answers to the "whys" behind everything. Concerning backstory, consider creating a Ghost or Black Moment somewhere in your protagonist's past. What's something tragic or dramatic that explains your character's flaw? How can you hint at this story to create mystery and make the reader ask questions about what happened? By answering some of the above questions, you should know a bit about the character's personality. See if you can find their MBTI type. One of the easiest ways I've found is to go down into the personality functions. If you know of a character whose personality is similar to your character's, see if you can find their MBTI type on mbtifiction.com. To get you started, here are a few questions: Is you character introvert or extroverted? Is she more focused on the physical or the abstract? Is she more present or past focused? Does she like to share her feelings or keep them to herself? Does she do her best thinking aloud or quietly and alone? Answering these questions will help guide you through the test as you discover her personality. Now that you've scooped the ice cream and topped it with whipped cream, you get to add sprinkles! There are a variety of sprinkles, but they have little impact on the taste of the sundae. Of course, they're still fun to add. 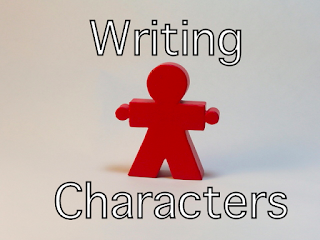 First of all, are there any certain aspects of appearance your character must have for this plot or story? Do the people of her race have a certain color of eyes? Does she have some unique feature that marks her as an outcast? For the less significant things, try out whatever appeals to you. Skim How to Write Descriptions of Hair and Skin and How to Write Descriptions of Eyes and Faces by Val Kovalin for ideas and descriptions of types/colors of hair and eyes, along with other physical attributes. If you want ideas for describing eyes and hair along with many other things, check out descriptionari.com. Now share the characters you've created! What's your character's Black Moment? Their personality? How would you describe their appearance?